The holidays are here and this means lights, decorations, candles, trees, and many other festive items that make our homes a little brighter, warmer, and fun. It also means our pets are exposed to items that could be harmful to them. Holiday decorations come in many sizes, forms, and materials. The candles in our menorahs for Hanukkah or the poinsettias in the window sill could cause major problems if our pets chew on them. Wires from lights and tinsel on Christmas trees can be hazardous too. 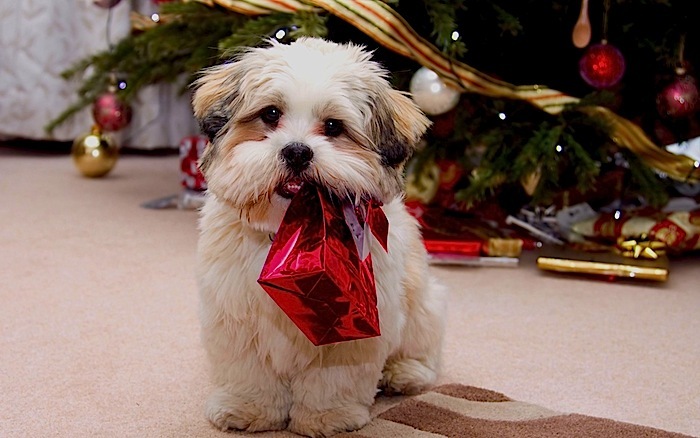 Holly, mistletoe, and poinsettias are toxic to pets. If you have these in your home, place them where your pet cannot reach them. It might be best to have these hanging outside on your porch or in planters where they decorate the steps up to your house if you have a very curious kitty or nosey dog. If you have a live tree in your house, keep the needles tidy. The needles can puncture the stomach lining. Clean up the needles that fall off as soon as possible. Ornaments on the tree are very intriguing to animals. In particular it seems cats get curious and will smack them around like it’s their own personal jungle gym. Dogs might try to carry an ornament and break it in their mouths. If you have a pet that plays with the ornament, try using a training spray that deters them. Avoid tinsel as cats have a tendency to chew it. The tinsel can cause blockages and make them very ill.
Keep the wires from lights, lamps, and other decorations tidy and tucked away so your rambunctious puppy or playful kitty doesn’t tug them or get tangled in them. Many hardware and house-ware stores sell cord covers and zip ties that can keep things neat. If your cat insists on drinking water from the bottom of the christmas tree, you may need to find a cover to prevent her from doing so. Dirty water can make your cat ill. Your dog may also think it’s a new water bowl and could knock decorations or the tree off the stand. Always keep fresh water out for your pets in their water bowls to urge them to not look anywhere else for a drink. And don’t forget to shop for your pets as you hit the stores this season!